In The Exorcist, what color robes does Father Karras wear when the audience sees him saying mass? Secondary trivia question: What season is it in the Catholic Church when the priest wears white? So, you people give me grief when I write stuff that doesn’t correspond to holidays (what you people will say to me on Flag Day, I have no idea), so I put forth the effort this Easter and watched the movie that I have long thought of as one of the most Easter of movies, The Exorcist. Before I get into how much of an Easter movie it is, can I just marvel at the beautiful construction of the film? The constant buildup of tension from beginning to end? The perfect composition within the frame? The marvelous sound design? I’ve never considered the movie to be scary, but I’ve always found it incredibly engrossing, involving, and an absolutely wonderful viewing experience from beginning to end. The characters (in particular Father Karras, who is the titular and main character of the film) are all wonderfully drawn. The plot is simple but a secondary consideration. The tone is consistent and perfect. Before I got end this slavish treatment of the film, let me note that Father Karras doesn’t come into contact with the possessed girl’s mother until more than an hour into the film. His half of the first hour is pure character work, creating a flawed, doubt-filled priest who is the perfect foil for the possessed Regan. So, having said that I love this movie as purely a film, why bring this up on Easter? 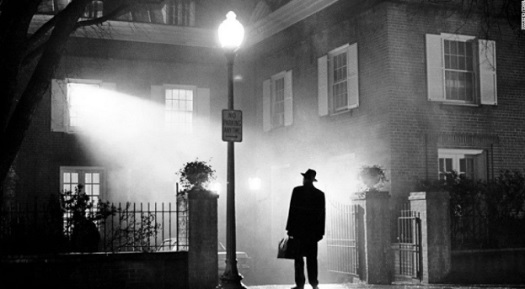 Aside from the fact that it takes place in the Easter season (as evidenced by Father Karras’ robes during mass), the movie is very much about Karras and his journey. Damian Karras starts the movie as a priest psychologist to other priests in the D.C. area (he works in Georgetown). While he tries to work with these other priests, he’s struggling with his own crisis of faith. Karras is at the depths of his despair stemming from his faith based issues as well as the recent death of his mother which he blames on himself when he is approached by Ellen Burstyn’s Chris MacNeil about the possession of her daughter. He’s doubtful of the claims of possession and walks into Regan’s bedroom wanting to disprove the idea of possession and point the girl’s problems towards psychology instead. Even after seeing things that go beyond the realm of basic psychological problems, Karras refuses to believe that a demon has possessed Regan. Even when he presents the case to his bishop for possession, he continues to express doubts about it. And still, we’re not at Easter movie. 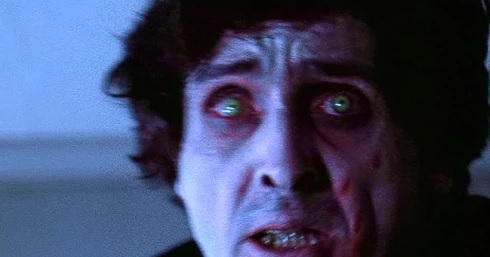 What makes this an Easter movie is the final moments where Karras confronts the demon in Regan’s body fully, his faith complete restored, and in need of saving Regan. In his final moments, Karras fully believes again in the conflict between God and Satan, and throws himself between the devil and this little girl, offering himself as a vessel for the devil in order to free the girl from its grip. And, with his final grasp of control of his own self, Karras throws his body out of the bedroom window, killing himself and casting the demon out from the world at the same time. It’s that sacrifice, and the fact that Regan survives the ordeal that makes The Exorcist an Easter movie. It’s the story of overcoming one’s doubts to the point where one can throw themselves in front of another to save them. In the movie’s closing scene, Regan, partially recovered, instinctively embraces another priest after considering his collar for a moment. She doesn’t exactly understand why this symbol of God should be thanked, but she does it anyway. This is the story of Easter, but told from the perspective of a flawed man who saves a small girl from the grasp of the devil. Obviously, there are other great Easter movies. Last year I recommended Pasolini’s The Gospel According to Saint Matthew (available on Amazon Prime for those interested), a movie that I seriously considered adding to my Top Ten of All Time once I saw it for the first time last April. What about you? Which is your favorite Easter Movie? I am a fiction writer living in Charleston, SC. I've had a variety of jobs, but nothing compared to what Heinlein had. I don't think that time I got hired to slay the wild and terrifying jack rabbit of Surrey counts since I actually only took out the mild mannered hedgehog of Suffolk. Let's just say that it doesn't go on the resume. Lover (but not, you know...lover) of movies. Married to the single most beautiful woman on Earth with a single son who shall rule after my death.